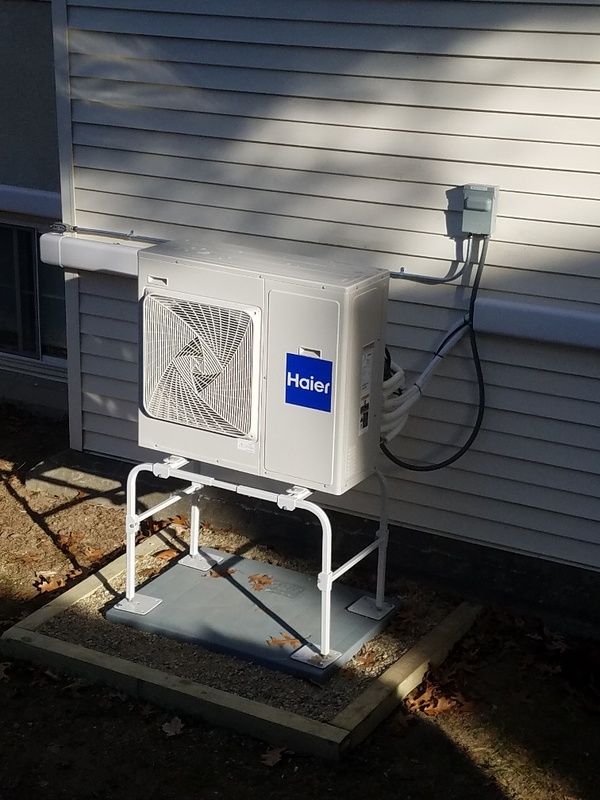 Our newest offering, Haier ductless HVAC systems are pretty impressive. They can provide heating down to -22F in the winter and cooling in the summer. And they do it incredibly efficiently. They are a great way to add heating and cooling to an area of your home that is not well served by the existing heating system. If you have a camp that is used for 3 seasons a ductless system may be all you need to vacation in comfort. You may wonder what a heat pump is. In simplest terms it's a device that moves heat from a colder spot to a warmer spot. You already have one in your home, your refrigerator. It takes the heat from inside the refrigerator and moves it to outside the refrigerator. And so the inside gets cooler. Ductless minisplits are one of the most efficient ways to provide heat to a space. During the heating season instead of burning a fuel or converting electricity directly into heat they use a little electricity to capture heat from outside and move it inside. In the summer they can reverse the process and cool the space. It may seem impossible in our really cold weather but there is still a lot of heat in the air even at our extreme temperatures. In fact there is heat in the air down to -460F. Imagine that.